KAD manufactures Sand Trap Louvers for fresh air intake in HVAC systems, which are designed to separate sand and dust particles at low and medium air velocities thus avoiding excessive dust loading on conventional secondary stage filters. They give excellent performance for air filtration and moderate pressure drops at low air velocities. 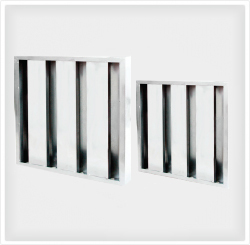 Drainage holes at the bottom of Sand Trap Louver makes it self-cleaning and maintenance free.